This paper describes the interrelations between the Israeli music and the music of other countries, the give and take relations. Three Israeli famous songs are used as an example: “Tsena Tsena” (Come Out), “Yerushalaim Shel Zahav”(Jerusalem of Gold) and “Bashana Haba’ah” (Next Year), their entrance into the music of other countries, and the modifications that happened while changing their “citizenship”. 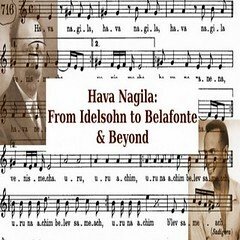 The genre “Songs of the Land of Israel“ is considered as the "folk" music of Israel. This repertoire, unlike most other folk music cultures, has developed mainly in the 20th century and consists of composed songs. Nevertheless, it complies with some of the characteristics conventionally attributed to "folk" music: It exists as an oral tradition and it is typically consumed in the framework of "Shira be-tzibbur" (communal singing). Read more about שירי ארץ ישראל? Songs of the Land of Israel?